Here’s another Italian-American bakery classic to add to your holiday cookie tray! 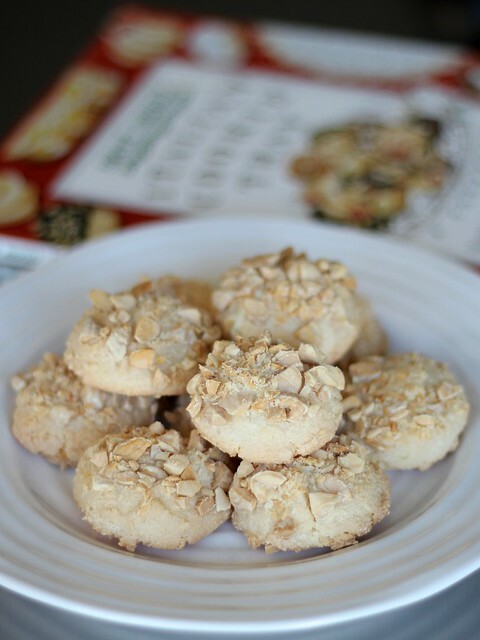 Naturally gluten-free, almond paste is simply combined with sugar, egg white and a splash of extract to create these chewy-crunchy amaretti cookies. For a touch of festive color, feel free to garnish the cookies with a candied cherry in place of chopped almonds. This recipe is very easy to scale up, and the cooled cookies — wrapped tightly in plastic wrap and placed in a freezer bag — freeze very well. Simply defrost for several hours at room temperature before serving. Preheat oven to 350°F. Line a large, rimmed sheet pan with a silicone baking mat or parchment paper; set aside. Crumble almond paste into the bowl of a stand mixer. Add sugars (white and powdered), and mix with the paddle attachment on medium speed until mixture resembles peas. Scrape down bowl, add egg white and extract; mix on medium speed for 2 minutes, scraping down bowl as needed. Scoop level tablespoons of dough — a portion scoop is very helpful here! 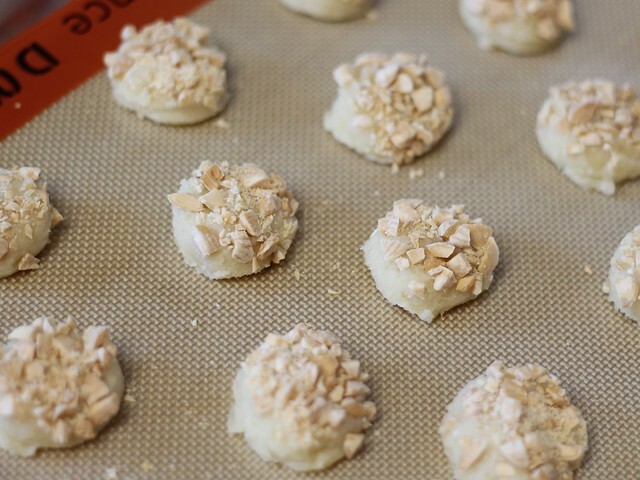 — press rounded side into chopped almonds, flattening cookie slightly. Set cookies on prepared pan, almond side up, leaving about 1 1⁄2” between them (the whole batch fits on one of the linked pans above). Place pan in preheated oven and bake cookies for 20 – 25 minutes or until lightly browned. Cool for about 5 minutes before transferring to a cooling rack. Allow to cool completely before serving! ¹ Tracking down Solo brand almond paste proved rather difficult for me, even with the use of their store finder. Thankfully, they sell cases directly from the factory; at this time in the US, a 6-pack will run you $30 including shipping. Click here for a listing of their gluten-free products (not produced in a dedicated gluten-free facility). If you’re going with another brand, be sure to read over the ingredients label carefully — a more readily available brand that comes in a 7-ounce tube (Odense) contains wheat starch-derived glucose syrup. ² I had Marcona almonds on hand, so that’s what I used. I like that they are slightly sweeter and softer than the usual almond variety.